And so the hospital saga continues. Of course it is political. Anyone that believes otherwise should open their eyes. But I really do question this process. What incentives exist for the group pondering the problem of where to put the hospital? None that I can see. One incentive for not coming to an early decision is the daily fees paid to the group. As far as I can see from attending sessions and reading the various reports, the main things seem to be that the ward block (nothing other than a number of dormitories) has a common floor level with the clinical services block which needs a slightly higher ceiling height to cater for larger equipment. This does not take rocket science to fix. Another thing is whether to rebuild further away from the University and its Health Science teaching. Why would you? The only reason that I can see for further delaying what seem simple issues are ones of Central Government funding and whether they are still keen on the support of the Medical School. It may be tempting to undermine the Uni Health Science, reduce the amount of teaching at the hospital and make the rebuild cheaper and that is political. A side issue – and it might not be a popular view – is that some things that the ODT and City campaigned on such as neurology may have backfired. Was winning a battle more important than winning the war? Russell – useful points. Internally, amongst the upper tiers of hospital operational management they know and privately say the fight for neurosurgery is not substantiated by the number of surgeries actually being carried out for the Otago Southland region. There is no doubt that the Neurosurgery battle was a silly one on a number of fronts. Put simply there isn’t the population base to warrant the establishment and maintenance of such a unit UNLESS a number of DHB’s work cooperatively to establish and run such a high specialist area. For example if the CDHB and the SDHB decided that all South Island neurosurgery should happen in Dunedin. That didn’t happen. The end result was that the new Chair of Neurosurgery was underworked and according to medical staff I spoke to was touting for business in the region. Way past time for a much wider strategic view be taken in the provision of high specialty medical services which I suggest would lead to much higher provision of run of the mill services. Rebuilding Dunedin Hospital as a top ﬂight teaching hospital in the central city is absolutely essential for the future of Dunedin. All around the world, a central city hospital close to a university and medical school is seen as optimal. 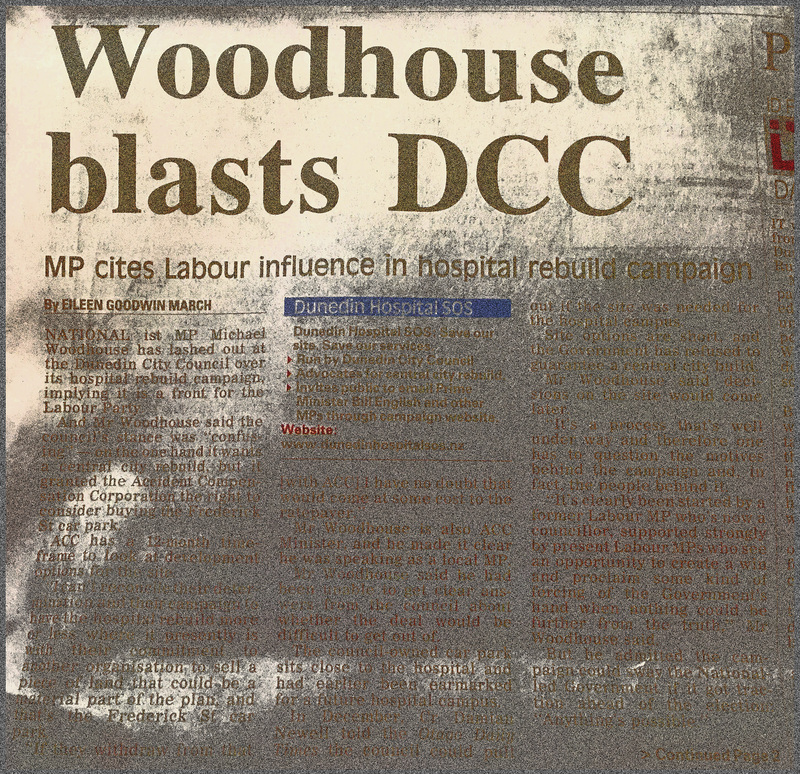 It’s difficult to identify anyone who wouldn’t be disadvantaged by moving Dunedin Hospital away from the central city. Outpatients and visitors catching buses to the soon to be completed nearby bus hub, retailers and cafes, and professors and medical students moving between the hospital and lecture theatres would all be affected. The criteria for the location of our new hospital must be more than just budgetary – more than just “what can we build for the lowest cost?” It also has to address what our community needs in the next 40 years in the way of health care and where that is best provided. The Council has passed a series of resolutions and told the Government that a hospital site must be located in the central city and anything else would be unacceptable and extremely costly to our community. We’ve expressed concerns about the alternative locations under consideration and about the delays in progress for this essential project. 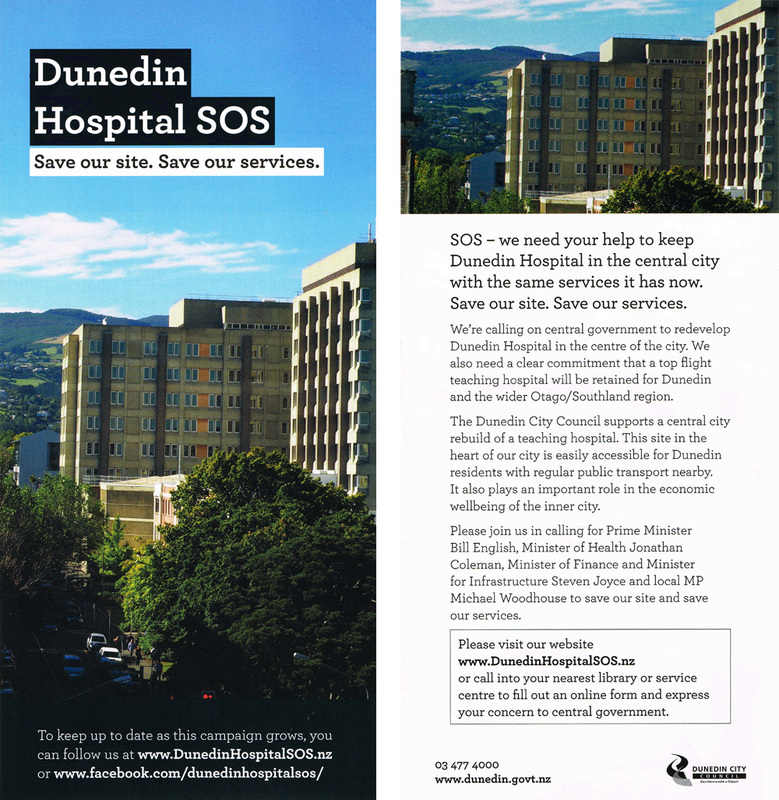 We’ve started a campaign, Dunedin Hospital SOS. 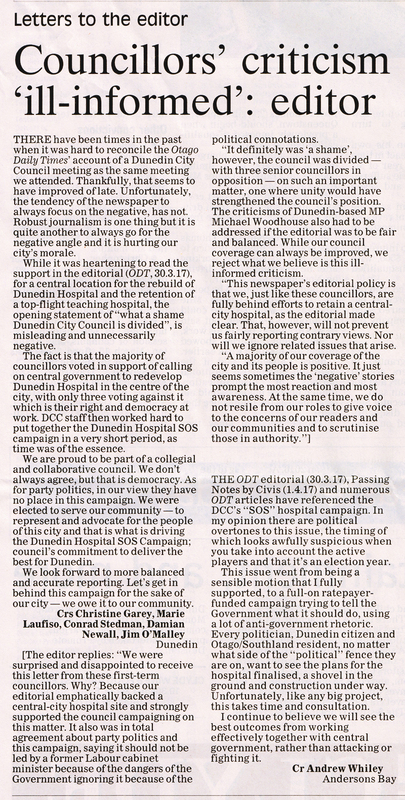 If you support rebuilding Dunedin Hospital as a top ﬂight teaching hospital in the central city, visit the website below or head into your nearest DCC library or service centre, ﬁll out the letter to Government ministers and make sure your voice is heard. The argument always seems to crop up in Dunedin that if you question or oppose something you are being negative. It doesn’t follow. You may be arguing for something better rather than opposing something for its own sake. Also, on council there seems to be an underlying conformity pressure on councillors to vote unanimously and when the councillors do express contrary views they are described as being ‘divided’ instead of just expressing different points of view. Lee Vandervis has frequently found himself on his own with a contrary vote and this is highlighted by those who don’t like his views. He is typically called ‘negative’. I find this intolerant. It is a bit like the controversy about the European Society set up by some students at the university (now abandoned). Those who opposed it described the society as ‘racist’. It might well be if you dig behind the surface….I don’t know… but interestingly a group of prominent New Zealanders, as a result, have spoken up about free speech and condemned ‘hate speech’ laws as not the way to go in terms of allowing the wider ideal of allowing democratic, free speech. Racists, etc are indeed repugnant creatures, but it is silly to try and censor them with hate speech laws. In a short time their mouths make them out as fools because they can’t back their arguments with facts. Trump in the USA is already coming unstuck with his own inanities caused by his big, bigoted gob. It’s really quite bad luck for those who invested in the South Pacific, Tulips and Poseidon that they did not listen to the alternative view. In the main the crowd view is often wrong. Lemmings have an awful record as a collective. Most of the progress made in society has been made as a result of inventions or discoveries of individuals. That is why social engineering is bound to fail. The smarties, opinion leaders, don’t want to be herded by the masses. I note that a hospital situated out of town would actually completely stuff the bus hub plan and the flight to cycle lanes plans. Me, I’ll just leave it all up to Richard Thomson to get the rebuild on track and in the right place. He is the past master of these imbroglios as he will readily tell if you cared to ask.